December 4, Fineko/abc.az. 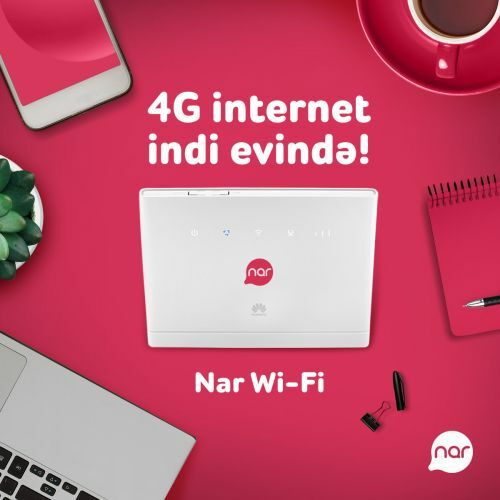 Nar- the country’s youngest and most innovative mobile operator has presented “Nar Wi-Fi” internet router, which provides access to high speed internet. This equipment allows up to 30 devices at once to get access to high speed internet (LTE/4G) at any location. Those who move to a new apartment or office, or those who are unable to connect to traditional internet at home can use the “Nar Wi-Fi” router and enjoy 4G internet at home instantly. This equipment provides possibility to gain access to internet from anywhere, provided that the area is covered with 4G-LTE network. “Nar Wi-Fi” is a wireless technology allowing connection to high speed internet of up to 20 mbps at homes, summer houses, offices and business areas. The equipment can be easily installed by the subscriber himself. By making an advance payment, the subscribers will acquire the device as well as up to 6 months of internet access. The device will start working automatically as soon as the SIM card with relevant tariff is inserted to the router, and it is connected to the power supply. “Nar Wi-Fi” which provides possibility to access high speed internet to small and medium size businesses in Azerbaijan, offers various options for each customer type (retail and business), by means of bundles with advantageous prices, speed and internet volume. Note that “Nar Wi-Fi” offers faster speeds than ADSL and provides unlimited internet bundles of up to 60GB to subscribers. More detailed information about “Nar Wi-Fi” and its sales points is available at nar.az/nar-wi-fi website. “Azerfon” LLC (Nar trademark) started its operations on March 21, 2007, and within a short period of time became one of the leading companies of the telecommunications and mobile communication industry of Azerbaijan. The ‘Nar’ brand name was selected as the symbol that resembles the cohesion of the rich cultural and historical heritage of Azerbaijan with the modern life. Being the first operator in the country to introduce the 3G technology, Nar provides the customers with a wide 4G network coverage. With a large network of over 7300 base stations, covering 97% of the country’s territory, Nar provides more than 2.2 million subscribers with the highest quality services. According to mobile network benchmarking tests, held in the year 2017, Nar network demonstrated the highest results in the country, in terms of provision of mobile voice services. Testing was conducted by an independent international “P3 Communications” company, and methodology was based on customer experience in using various services.